Ready to learn how you can deliver the ultimate call center experience? In-Call RescueRescue customers who are waiting on hold by offering a call-back from the next available agent. Mobile RescueLet customers easily request a call-back from a live agent, directly from within your mobile app. Web RescueEnable customers to seamlessly transition from web to live assistance. Why Call Center BPOs Need to Offer Call-BacksLearn the major reasons why BPOs can benefit from offering call-backs. Why You Shouldn’t Trust A Call-Back AlgorithmA poorly executed call-back strategy can put undue stress on the call center, frustrating customers in the process. Fonolo Call-Back for Employee SupportConnect employees to your support center with one click and boost productivity. First Service Credit UnionHow a credit union improved the customer experience with call-backs. The GeneralHow an insurance provider reduced abandonment rates and improved the customer experience with call-backs. Velocity Credit UnionHow adding call-backs to a legacy call center reduced abandon rates by 62%. NutrisystemHow a call center has successfully managed spikes in call volume, and lowered caller abandonment. Payless FurnitureHow New York’s Payless Furniture improved the customer experience with call-backs. Ascend Federal Credit UnionHow a credit union reduced abandon rates by 50% and lowered cost-per-call. Credit Union of Colorado How a credit union reduced abandon rates by 40% and improved the member experience. Stanford Federal Credit UnionHow a credit union reduced abandon rates by 50% and increased service levels by 43%. SuddenlinkHow a major cable operator eliminated over 400,000 minutes of hold-time. Tech CUHow a credit union reduced abandon rates by 37%. Bright HorizonsHow a child care provider reduced abandon rates by 33%. Vesta NetworksHow a call center reduced cost-per-call by 8%. 1st United Services Credit UnionHow a credit union generated $10M in new loans. OptusHow a major mobile carrier reduced cost-per-call by 14%. 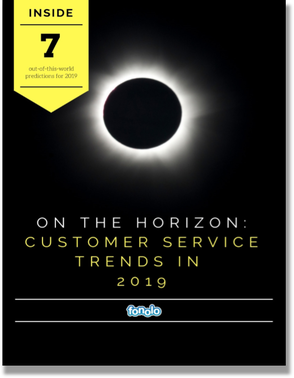 On the Horizon: Customer Service Trends for 20197 trends that will dramatically affect the success of your support team. The Top Contact Center Trends to Watch in 2019It’s a bird. It’s a plane! No, it’s the top contact center trends to watch for in 2019. And we’ve got you covered. Call Center 101: The Golden Rules of SLAs If you’re looking to quickly study up on SLAs, look no further. Download this white paper to become an expert. CX Trends You Need to Watch in 2018It’s time to invite your customers onto your team, and win! In this report, we outline the predicted trends for improving CX this year. 10 Trends That Will Disrupt Customer Service in 2018This white paper examines 10 trends that will dramatically affect the success of your support team. The Secret Sauce for Increasing Customer HappinessLearn the key ingredients for making customer happiness the forefront of every business interaction. 9 Critical Contact Center Trends for 2018Several trends are poised to make a significant impact on contact centers around the globe. This white paper explores key areas that are sure to shake up the industry. Why Your Call Center Should Not Send Customers to Voicemail Learn the major problems that can occur when using voicemail in the contact center. The New Customer Service LexiconIn this whitepaper, we’ll discuss terms that are either new to the customer service sector, or have a recently changed meaning. Mastering #CX in the Contact Center: 7 Tips to FollowUsing these seven tips, we can creatively transform your customer service vision and turn your contact center into a haven for great customer experiences. The Call Center Guide to Managing Spikes in Call VolumeWhat happens when call volume gets out of control? Do you have a strategy to ensure the experience doesn’t suffer? This guide will tackle those questions head on! Call Center Metrics: 4 Pitfalls You Need to AvoidThere are 4 call center metrics that are critical to track and get right. Here are common mistakes made when measuring or interpreting these metrics. 10 Customer Service Statistics You Need to KnowConsumers are demanding more and their choices are expanding, which means that better service will lead to greater loyalty. See why these 10 statistics are what you need to know. The Executive Guide to Improving 6 Call Center MetricsMeasuring and improving call center metrics can be a pain point for executives. Download our free guide to help you improve 6 key metrics for better performance. Are You Losing Customers to Hold Time?Businesses lose customers every day through the simple act of putting them on hold. Learn the best way to eliminate hold time and improve the customer experience.